In this study we quantified the annual soil CO2 efflux (annual SCE) of a short rotation coppice plantation in its establishment phase. We aimed to examine the effect of former (agricultural) land use type, inter-row spacing and genotype. Annual SCE was quantified during the second growth year of the establishment rotation in a large scale poplar plantation in Flanders. Automated chambers were distributed over the two former land use types, the two different inter-row spacings and under two poplar genotypes. Additional measurements of C, N, P, K, Mg, Ca and Na concentrations of the soil, pH, bulk density, fine root biomass, microbial biomass C, soil mineralization rate, distance to trees and tree diameters were performed at the end of the second growth year. Total carbon loss from soil CO2 efflux was valued at 589 g m−2 yr−1. Annual SCE was higher in former pasture as compared to cropland, higher in the narrow than in the wider inter-row spacings, but no effect of genotype was found. Spatial differences in site characteristics are of great importance for understanding the effect of ecosystem management and land use change on soil respiration processes and need to be taken into account in modeling efforts of the carbon balance. At present, there is a large interest in the use of energy from biomass as one of the alternatives for fossil fuels and as a possibility to reduce greenhouse gas emissions (Buyx and Tait 2011). The establishment of short rotation coppice (SRC) plantations for bioenergy production has potential for sequestering CO2 and for mitigating increased greenhouse gas levels in the atmosphere (House et al. 2002). It has often been assumed that the CO2 emissions of bioenergy cultures are zero (Hansen 1993) by taking up as much carbon during the growth of the SRC plantation as released upon conversion to energy, i.e. that they are so-called ‘carbon neutral’. However, bioenergy cultures as SRC plantations can also represent a CO2 source, particularly in the short to medium term (Vande Walle 2007). The net carbon (C) benefit of such plantations is site specific (Arevalo et al. 2011). It is therefore important to study the carbon cycle of these ecosystems in more detail and to assess their impact on regional carbon balances (Vande Walle et al. 2007). The main reason for young SRC plantations to act as a CO2 source is due to the process of land use change. They are expected to act as a C source during the first years of the establishment as a result of cultivation practices that accelerate short-term decomposition of organic matter in the soil (Grigal and Berguson 1998; Arevalo et al. 2011). The soil CO2 efflux (SCE) is therefore one of the most important processes in the total C balance of the ecosystem. In temperate forests more than two-thirds of ecosystem respiration may be attributed to SCE (Curiel Yuste et al. 2005; Luyssaert et al. 2007). But until now SCE has been rarely studied in SRC plantations (Vande Walle et al. 2007; Lagomarsino et al. 2012). Furthermore, the temporal variability of SCE has been widely studied, whereas the spatial variability of SCE remains under-researched (Ngao et al. 2012). This study is part of an ambitious large-scale project (POPFULL: http://webh01.ua.ac.be/popfull/) aiming to make a full greenhouse gas balance and to investigate the economic and energetic efficiency of a SRC culture with poplar. Within the context of this project, the objectives of this study were (i) to quantify the carbon loss via the SCE in a newly established short rotation coppice plantation in Belgium; (ii) to examine the influence of the spatial factors: former land use type, inter-row spacing and tree genotype; (iii) to identify the underlying factors driving these influences. The POPFULL experimental site of this study is located in the northern part of Belgium (Lochristi, 51°06′44″ N, 3°51′02″ E) and subjected to a temperate oceanic climate with a long-term (30 years) average annual temperature and precipitation of 9.5 °C and 726 mm, respectively (Royal Meteorological Institute of Belgium 2012). The 18.4 ha site was a former farmland consisting of an adjacent set of parcels of pasture and croplands with corn as the most recent cultivated crop in rotation. Fertilization was applied during crop production as liquid animal manure and chemical fertilizers at a rate of 200-300 kg ha−1 yr−1 of nitrogen (N). Before plantation establishment, a soil survey was carried out by soil sampling on 110 locations, spatially distributed over the two former land use types (Broeckx et al. 2012). This survey revealed that there was no significant difference in the total carbon (C) and N contents in the upper 90 cm of the soil among the two land use types, possibly because of rotation in land use between cropland and pasture, or because of the substantial manure input. Average C and N contents in pasture were 106.0 ± 30.4 Mg ha−1 and 9.4 ± 1.4 Mg ha−1, respectively. For cropland these values were 111.7 ± 32.9 Mg ha−1 and 9.1 ± 2.1 Mg ha−1, respectively. However, land use type did influence the upper soil layer (up to 15 cm): C and N mass fractions were significantly higher and bulk density was significantly lower in pasture as compared to cropland (Table 1). According to the Belgian soil classification the region of the site forms part of a sandy region with a poor natural drainage (Van Ranst and Sys 2000). This was evidenced from granular analyses, which characterized the soil with a sandy texture and a clay-enriched deeper soil layer at 75 cm. In March 2010 the total land area of former pasture and cropland was prepared with a pre-emergent herbicide treatment followed by ploughing (up to 60 cm depth) and tilling. An area of 14.5 ha (excluding the 3.9 ha of headland around the plantation) was subsequently planted with commercially available poplar (Populus) and willow (Salix) genotypes representing different species and hybrids (Broeckx et al. 2012). 25 cm long dormant and unrooted cuttings were planted in a double-row planting scheme with alternating inter-row spacings of 0.75 m and 1.50 m, and an average distance of 1.10 m between trees within a row. This yielded a planting density of 8000 plants ha−1. The plantation was designed in large monoclonal blocks of eight double rows wide that cover the two types of former land use. The site was neither fertilized, nor irrigated. During the growth years 2010 and 2011 intensive weed control was applied by mechanical, manual as well as chemical treatments. On 2–3 February 2012 the plantation was harvested for the first time after a two-year rotation. A more detailed description of the plantation and of the plant materials is provided in Broeckx et al. (2012). The SCE was measured by an automated soil CO2 flux system (LI-8100, LI-COR Biosciences, Lincoln, NE, USA). Sixteen long-term soil chambers (type LI-8100-104, LI-COR Biosciences, Lincoln, NE, USA) operating as closed systems were connected to an infrared gas analyzer through a multiplexer (LI-8150, LI-COR Biosciences, Lincoln, NE, USA). PVC collars of 20 cm inner diameter and 11 cm height were inserted in the soil extending 3 cm above the soil surface. The soil CO2 flux system was installed on 28 March 2011 and logged the SCE for each chamber successively every hour till 31 January 2012. For every measurement the analyzer used the rate of increase of CO2 in a chamber during 120 s after placement on the collar to estimate the diffusion rate of CO2 into free air. The automated measurement cycle was briefly interrupted every 10 days (on average) for data collection. Throughout the growing season, weeds were manually removed from inside the collars by clipping or carefully pulling, with a minimal disturbance of the soil. Consequently, it was inevitable to leave some weed roots in the soil. The chambers were spatially distributed covering both former land use types (pasture vs. cropland), both inter-row spacings (0.75 m vs. 1.50 m) and two hybrid genotypes: Grimminge (P. deltoides Marsh. x (P. trichocarpa Hook. x P. deltoides Marsh.)) and Skado (P. trichocarpa Hook. x P.maximowiczii Henry). For each of these three factors, half of the collars were placed in each of both factor options, yielding two chambers per combination of land use type x genotype x inter-row spacing (Fig. 1). The analyzer unit and multiplexer were placed on the transition of two former land use types, and perpendicular to this border, in the middle of the two genotypes of interest. Restricted by the cable length between the soil chambers and the multiplexer, collars were placed within a rectangle of 26 m by 16 m, though as far as possible from the borders of adjacent land use types and genotypes. This configuration resulted in a grouping of four plots of four chambers (Fig. 1). In the immediate vicinity of each chamber a soil temperature thermistor (type 8150–203, LI-COR Biosciences, Lincoln, NE, USA) was installed at 5 cm depth on 23 May 2011. The thermistors were attached to one of the integrated sensor inputs of the soil chambers enabling to record soil temperature simultaneously with every measurement. This soil temperature is further referred to as the soil temperature at 5 cm depth. At about 30 m away from the LI-8100 system, a set of environmental variables was continuously recorded (Zona et al. 2013). Soil temperature at 0-10 cm depth was measured using a thermocouple (model TCAV-L, Campbell Scientific, Logan, UT, USA) every 10 s and the 30 min averages were stored on a data logger. From 1 April 2011 (3 days after installation) till 31 December 2011 data coverage was about 90% with occasional gaps due to power failure caused by heavy rainfall and/or thunderstorms. Gap filling and extrapolation of SCE for the period of January to March 2011 were subsequently performed by an Artificial Neural Network (ANN) analysis in MATLAB (7.12.0, 2011 Mathworks, Natick, Massachusetts, USA). The soil temperature monitored throughout the year with the 0–10 cm deep thermocouple was used as input in a feed-forward ANN for every chamber, resulting in overall R2 values between 0.84 and 0.93. In each of the four plots, one chamber was also equipped with a soil moisture sensor (EC-5, Decagon Devices Inc., Pullman, WA, USA) through one of the integrated sensor inputs. Within each land use type, one sensor was put in a narrow inter-row spacing and one in the wider inter-row spacing (Fig. 1). A soil-specific sensor calibration was conducted in the laboratory with disturbed soil samples (Cobos and Chambers 2010). Volumetric soil moisture content at 5 cm depth was recorded concurrently with the chamber SCE measurement. At the end of January 2012, right before the harvest of the plantation, all 16 chambers were removed. From the upper 15 cm soil layer within each collar, one root sample was taken by the core method (Oliveira et al. 2000; Berhongaray et al. 2012). Soil cores were 10 cm in diameter by 15 cm in depth. In SRC plantations with poplar roots are concentrated in the upper 20 cm of the soil profile, especially when a lough pan of agricultural history is present (Dickmann and Pregitzer 1992; Makeschin 1994). Fine roots (Ø < 2 mm) were picked from the sample by hand and oven dried to determine the dry root biomass per surface area in the upper 15 cm soil layer. No distinction was made between (the few) weed roots and poplar roots. The remaining of the soil in the 15 cm top layer within the collar was collected for analysis of total soil C and N, C:N ratio, pH, concentration of the elements P, K, Mg, Ca and Na, dissolved organic carbon (DOC), microbial biomass carbon (MBC) and soil C mineralization rate. After homogenizing the soil by mixing for 5 min in a container, part of the soil was put in a drying oven for C and N analysis, while the remaining was put in the freezer at −20 °C until the time of analysis of MBC and soil C mineralization. Because of the limited surface area within the collar, a bulk density sample of the upper soil layer was collected next to each of the collars. This sampling was taken very close to each collar (few cm away) on an undisturbed and similar soil surface as within the particular collar. These 100 cm3 core samples (Eijkelkamp Agrisearch equipment, Netherlands) were oven dried for dry mass determination. For every collar the distances to the three nearest trees were measured, as well as the stem diameter at 22 cm height of these three trees using a digital caliper (Mitutoyo, CD-15DC, UK, 0.01 mm precision). The average tree-to-collar distance per chamber and the sum of the proportions of the stem diameter to the distance for the three nearest trees were used in further analysis. Total C and N mass fractions were analyzed by dry combustion with an NC element analyzer (NC-2100, Carlo Erba Instruments, Italy). The C:N ratio was calculated as the ratio of the C and N mass fractions. The pH was measured with a glass electrode in a KCl solution. Mass fractions of P, K, Mg, Ca and Na were measured using inductively coupled plasma (ICP) analysis, based on the method of Egner et al. (1960). Concentrations of DOC and MBC were analyzed in the laboratory using Continuous Flow Analysis (CFA) (San++ Automated Wet Chemistry Analyzer, Skalar Analytical, The Netherlands) on 0.5 M K2SO4 soil extracts from non-fumigated samples as well as from fumigated samples for the MBC determination (according to Joergensen and Brookes 1990). Soil C mineralization was measured during 80 days on soil samples incubated at 20 °C and kept at 60% of their water holding capacity. During the incubation mineralized CO2 was frequently measured (every 2 to 7 days) using infra-red gas analysis (EGM-4; PP-Systems, Hertfordshire, U.K.), according to the method of Rasmussen et al. (2006). From the extensive soil survey in March 2010 – i.e. before plantation establishment (see Broeckx et al. 2012) – eight sample locations were selected for comparison with the results of the 2012 soil sampling in the collars. The eight sample points were located as close as possible (within a maximal distance of 40 m of the collar plots) in the same cropland and pasture parcels of the collar placement. C and N mass fractions and bulk density of the upper 15 cm soil layer were determined using the same methodology as described above. Similarly mass fractions of P, K, Mg, Ca and Na and pH were determined with the above described methodology. A value for the annual carbon loss from SCE, hereafter referred to as annual SCE (C loss in g m−2 yr−1), was calculated by integrating the gap filled SCE data of 2011 over time. A three-way analysis of variance (ANOVA) was performed on these values with land use type, inter-row spacing and genotype as fixed factors, also including their interactions. The effect of the grouping of soil chambers was represented by the interaction of land use and genotype. The effect of significant factors was then examined on the soil and tree related parameters. To study the influence of soil and tree related parameters on the SCE, bivariate correlations were made with annual SCE and between all parameters mutually. For normalization a log10-transformation was performed on the data of root biomass, C mass fraction, C:N ratio, DOC, K mass fraction and the combined tree diameter and distance factor. The Pearson correlation coefficient was used to evaluate the correlation. To further investigate the importance of these potential driving factors of annual SCE, all the parameters that showed a significant correlation with annual SCE, were subsequently used in a forward stepwise linear regression. where R represents the SCE rate, R10 is the SCE rate at 10 °C, Q10 is the temperature sensitivity and T is the soil temperature in °C at 5 cm depth. Since R10 and Q10 fluctuated over time, this function was fitted on the data of time intervals of 3 days (72 h, i.e. 72 data points). The three-day window was then repeatedly shifted 1 h further in time, thus providing for every hour a regression of the coming 72 h. The regression was restricted to non-gap filled data; hence only the period of May to December 2011 was used. Only regression fits were used for which the p-value of fitting was <0.050. To compare soil chambers, a temporal average of R10 and Q10 was used. These averages of R10 and Q10 were calculated only from values at time points for which for all chambers a significant regression could be established (leaving a data set with n = 1405 per chamber). Consequently these averages did not exactly represent a yearly average, also because January-April was not included in the analysis. Since we were interested in the spatial differences among the chambers these averages were nevertheless used. Besides, we also fitted the Q10 function for each chamber on the total dataset pooled over the year. We calculated these ‘annual Q10’ values to compare with other studies, which commonly apply the Q10 function on annual or seasonal data. Annual and average R10 and Q10 were included in the correlation analysis and ANOVA. Since SWC was not measured at all 16 chamber locations, SWC was compared among the four selected chambers (one within each plot) by performing an ANOVA over all logged measurements (n = 14750) with land use type and inter-row spacing as fixed factors and their interaction as the effect of chamber/plot. Data of soil parameters of 2010 were tested for the effect of land use type with a non-parametric Mann Withney U Test. When not specified, differences are reported significant at p ≤ 0.050. The coefficient of variance (CV) of a specific parameter was calculated as the ratio of its standard deviation to its average value, reported as a percentage (%). All above analyses were performed in SPSS (Version 20, SPSS Inc., Chicago, IL, USA) and/or MATLAB. The main effects of land use type (p < 0.001) and inter-row spacing (p = 0.002) on the annual SCE were significant, whereas no significant effect of genotype was observed. None of the interaction terms was significant. Results of the ANOVA on the soil and tree related parameters and averages of the parameter values are shown in Table 1. Annual SCE over 2011 was higher in pasture than in cropland: 740 g m−2 yr−1 versus 496 g m−2 yr−1, respectively. An average of the annual SCE was calculated at 589 g m−2 yr−1 by weighting land use types by their proportion of land area; this corresponded to an average (over year and former land use types) SCE rate of 1.56 μmol m−2 s−1. The difference between land use types was also expressed in a significantly higher R10 in pasture compared to cropland. Similarly higher C and N mass fractions were found for pasture than for cropland. This was also true in 2010 before the establishment of the plantation, although the values were then much higher. Both P and K mass fractions, and pH were significantly higher in cropland. The annual average soil temperature was significantly higher in pasture, although differences were ecologically irrelevant: average of 12.71 °C for pasture vs. 12.56 °C for cropland. Furthermore variations in temperature were very small; the coefficient of variation was 1% for both within land use types and overall (with n = 16). The annual average of the volumetric soil water content at 5 cm depth was 23.9% over the four measurement locations, but this value varied of course during the season (ranging from 8.6% in the driest period (May-June 2011) to 43.1% in autumn and winter; data not shown). Soil water content was significantly higher in cropland (+2.6%) as compared to pasture. This could probably be explained by the spatial differences in topography (e.g. some minor depressions) rather than by the former land use type. Moreover, the interaction between land use type and inter-row spacing was significant which means that average values differed significantly among the four selected chambers. Annual SCE was larger in the narrow inter-row spacings of 75 cm as compared to the wider spacings of 150 cm (Table 1). The associated R10 was significantly lower in the wider spacings as well. Average soil temperature was only 0.15 °C higher in the wider spacing as compared to the narrow one and thus as mentioned previously not relevant. Moreover, these temperature differences are much smaller than the sensor accuracy of ± 1 °C. More roots were found in the narrow row spacings, where also bulk density was lower. Logically, the nearest tree was on average closer to the collar in the narrow spacings than in the wider spacings. In 2010 before plantation establishment, the average C mass fractions in the upper 15 cm soil layer were 1.19% and 1.74% for cropland and pasture, respectively, and these decreased drastically in 2012 (by 31% to 42%), down to 0.82% and 1.01%, respectively (Table 1). On the other hand, bulk density slightly increased from 1.357 g cm−3 and 1.240 g cm−3 in cropland and pasture, respectively, in 2010, to 1.521 g cm−3 and 1.515 g cm−3 in 2012. Thus, after 2 years differences in soil C stock between former land use types diminished or disappeared. Combination of the data of soil carbon and bulk density showed a C loss from the upper 15 cm of the soil pool of 938 g m−2 in pasture and 559 g m−2 in cropland over the period March 2010 to February 2012. Weighted by land use area this corresponded to an average loss of carbon of 703 g m−2 (over 23 months) or 26% of the C that was present in the upper 15 cm before the establishment of the plantation. Considering the 0–90 cm soil profile, this loss from the upper layer equals 7% of the initial stock in the upper 90 cm soil layer. The total ecosystem respiration (Reco) of this plantation over the year 2011 was quantified as 1469 g m−2 C loss using the eddy-covariance technique (Zona et al. 2013). The uptake of carbon through gross primary production (GPP) was assessed at 1564 g m−2. For the period of June-December 2010 the Reco and GPP fluxes had absolute values of 607 g m−2 and 531 g m−2, respectively (Zona et al. 2013). Assuming a heterotrophic contribution of 60% (Hanson et al. 2000) in the annual SCE in 2011 (annual SCEh, 353 g m−2 of C), we calculated the ratio of autotrophic respiration to GPP ((Reco- annual SCEh)/GPP). Using this ratio for estimating the autotrophic respiration from GPP in 2010 and subsequently subtracting this from Reco, annual SCEh was estimated at 228 g m−2 of C for the period of June-December 2010. By summing both annual SCEh values for 2010 and 2011 (and by including measurements of January 2011 valued at 10 g m−2) a C loss of 592 g m−2 was obtained. The difference between this value of 592 g m−2 and the carbon loss determined from the above described soil sampling was 111 g m−2 (Fig. 2). Probably this corresponded to the amount of carbon lost from the soil during the period shortly after land preparation (ploughing) and before the onset of the eddy covariance measurements (from April to June 2011). An overview of the results of the correlation analysis between annual SCE and the different soil and tree related parameters is provided in Fig. 3. The C:N ratio, the Q10 from the pooled data, Mg, Ca and Na mass fractions were not included in Fig. 3 since no significant correlations were found with and between these parameters. Annual SCE was significantly (p ≤ 0.050) positively correlated with its derivate R10, with C mass fraction and with DOC concentration, and was negatively correlated with the soil bulk density, with pH, with P and K mass fractions and with Q10. Weak correlations (p ≤ 0.100) were also found with root biomass and with the tree related parameters. Similar correlation patterns were found for R10. Opposite correlations were found for Q10, though only with the tree related parameters. Correlations among several soil and tree related parameters mutually were significant (Fig. 3). The distance to the nearest tree was positively correlated with bulk density and negatively with the amount of roots. For C mass fractions, positive correlations were found with N mass fractions, concentrations of DOC (and MBC with p = 0.069), and negative correlations with pH and K mass fractions. The pH was on its turn correlated with N, C, P and K mass fractions, with concentrations of DOC and with MBC. The average C mineralization rate was positively correlated with the total soil N mass fraction. The overall multiple regression model finally included bulk density (p ≤ 0.001, predictor importance = 72%) and K and P mass fractions (p = 0.022 and p = 0.023 respectively, both with a predictor importance of 14%) as explaining variables. The model accuracy (adjusted R2) was 86%. The annual SCE of the present study, 589 g m−2 yr−1 of C, was comparable to (Lagomarsino et al. 2012) or lower than values reported for SRC plantations in Europe (King et al. 2004; Vande Walle et al. 2007; Abou Jaoudé et al. 2011). Two-year old poplar plantations in Canada and China showed higher SCE rates up to annual means of 5.74 μmol m−2 s−1 (Arevalo et al. 2011; Yan et al. 2011). Whereas the average fine root biomass sampled in our field amounted to 34.2 g m−2 in the 15 cm upper soil layer (average of the two former land use types, Table 1), all these afore mentioned studies reported root biomass values of more than 100 g m−2. The low values in our study could be attributed to the fact that the two-year old trees of our plantation were raised from cuttings, while the previously mentioned studies used coppice stools or plantations established from rooted plantlets. Furthermore, our soil was characterized by a high N-availability, resulting from the previous agricultural land use. The high N-availability favours carbohydrate allocation to above-ground plant parts above the investment in (fine) roots (Ågren and Franklin 2003) or in exudation and root symbionts (Vicca et al. 2012). Leaf N mass fractions in the second growth year were on average 3.54% (CV of 18%) (Broeckx et al. 2012). Differences in soil N content determine variations in the soil respiration of forest ecosystems (Xu and Qi 2001; Pangle and Seiler 2002), but the importance of the N mass fraction as a driving factor for SCE was not evidenced in the present study. The N mass fraction was not retained in the model of the overall multiple regression analysis, and no correlation was found between N mass fraction and annual SCE (Fig. 3). However, (i) N mass fractions were strongly correlated (p < 0.001) with C mass fractions which on their turn were strongly related to annual SCE, and (ii) significantly higher N mass fractions were found in pasture versus cropland, which had a higher respectively lower annual SCE. Total N was found to increase SCE, since it provides a source of protein for microbial growth (Tewary et al. 1982). Accordingly, we found a weak (p < 0.100) positive correlation of N and mass fraction with the average C mineralization rate and with MBC which was on its turn positively correlated with annual SCE. The increase of soil bulk density in the top soil layer (Fig. 2) was due to the naturally occurring compaction, which generally occurs in the first years after plantation establishment (Makeschin 1994). The loose top soil created at land preparation is very susceptible to splash erosion causing the easy degradation of soil aggregates and the formation of a surface seal (Morgan 2005). This sealing effect was most pronounced at specific locations of our field site where water shortly stagnated after long or intensive periods of rainfall. High amounts of cumulative rainfall cause a reduction in infiltration rate in the soil due to the decrease in matric potential (Hillel 2004) and the development of a seal at the surface (Morin et al. 1981; Le Bissonnais 1995). Furthermore, when the soil becomes water saturated, SCE may decrease because the transport of gases is reduced and microbial activity is inhibited due to low concentrations of oxygen (Prolingheuer et al. 2010). Since both land use types encountered the same tilling and ploughing management in preparation of the plantation, the effect of former land use weakened after the establishment. Average bulk density increased in both land use types to the same degree, whereas the pasture previously had a significantly less dense top soil layer. Although the average bulk density of 1.52 g cm−3 was rather high, it is still below the upper threshold of 1.60 g cm−3 referred to as ideal for plant growth in a sandy soil (Arshad et al. 1996). Nevertheless, surface sealing hampers the diffusion of gases by reducing the topsoil porosity, thus diminishing SCE (Ball et al. 1999). The correlation analysis revealed that the annual SCE was negatively correlated with the top soil bulk density (Fig. 3), as previously reported (Xu and Qi 2001; Søe and Buchmann 2005; Ngao et al. 2012); this might indicate the importance of pore space for microbial activity (Doran et al. 1990). Our overall multiple regression analysis showed that bulk density explained the largest part (72%) of the variation in annual SCE. Differences in soil bulk density also showed up between both inter-row spacings, which was linked to the difference in root biomass. The higher amount of roots in the narrow spacings favoured soil structure by retaining the soil matrix and at the same time increasing the pore space through root penetration, therefore decreasing the soil bulk density. Also, roots prefer to grow in less compacted soils where nutrient cycling is also higher. Furthermore, the wide inter-row spacings are rarely – once a year on average – subjected to compaction by tractor passing, whereas the narrow spacings never are. In a corn field Rochette et al. (1991) observed a higher SCE in the row as compared to the inter-row. In wet soil conditions of that corn field, SCE was lower in compacted inter-rows versus non compacted inter-rows. Likewise, we found a higher SCE in the narrow inter-row spacings (comparable with the ‘row’-data in a single row crop) than in the wider spacings (comparable with the ‘inter-row’-data in a single row crop). The lower SCE could be caused by the more anaerobic environment during wet periods, or a lower diffusion to the surface of denser (compacted) soils with a higher proportion of water-filled pores (Rochette et al. 1991). The higher soil water content in the wider inter-row spacings might also illustrate this effect of a wetter and less permeable soil as compared to the smaller inter-row spacings. With regard to the higher annual SCE in pasture as compared to cropland, the principal effect of former land use type on the carbon loss is the carbon content of the upper soil layer. The initial carbon mass fraction in 2010 was 46% higher in pasture compared to cropland. Although absolute values as well as the difference between both decreased, the carbon mass fraction after 2 years was still 23% higher in pasture than in former cropland. This persisting difference also sustained the higher annual SCE from the soil in pasture. However, in contrast with what we expected no difference in C mineralization rate per unit of soil between both former land use types was observed. The higher C in pasture mainly resulted from the year-long turnover of grass roots, continuously enriching the soil in C. On the cropland in contrast, both crops and crop residues were yearly removed, and especially the annual soil ploughing, caused a depletion in carbon. Based on the decline of the soil C pool in the upper layer in former pasture, 938 g m−2 of carbon was lost from the soil over the first 2 years of the SRC plantation. However, ploughing in pasture might have altered the vertical distribution of soil C from before plantation establishment (Broeckx et al. 2012), by possibly mixing the upper layer with deeper (up to 60 cm depth) soil layers with lower C mass fraction. It is known that grasslands loose soil carbon rapidly when cultivated (Mann 1986; Burke et al. 1989; Guo and Gifford 2002). The observed decrease in soil C was due to the rapid decomposition of exposed ploughed soil during the first years after plantation establishment because of enhanced soil aeration (Mallik and Hu 1997), which mostly occurs from the surface soil layer (Hansen 1993). Several studies have shown the initial decrease in the soil C stock during the first years after plantation establishment, followed by an increase in soil C during the following years (Hansen 1993; Grigal and Berguson 1998; Hellebrand et al. 2010; Arevalo et al. 2011; Zenone et al. 2011). Arevalo et al. (2011) observed a soil C loss of 800 g m−2 in the first 2 years after plantation establishment, corresponding to a loss of 7% in initial soil C stock. We also found a decrease in soil C from the upper 15 cm soil layer of 7% of the initial C stock in the soil profile of 0–90 cm depth. Several studies reported values between 10 and 60% of soil C loss from the upper 1 m of soil after land use changes (Davidson and Ackerman 1993; Guo and Gifford 2002). Furthermore, in sandy soils the decomposition rate of organic matter generally tends to be higher as compared to silt and clay soils (Sorensen 1981; Paul et al. 2002). The smaller surface area and surface charge of coarse soil particles as in the sandy soils at our field site do not favour the formation of organo-mineral complexes that preserve C from microbial oxidation (Oades 1988; Grigal and Berguson 1998). Analogous with the negative correlation of annual SCE with pH, the lower annual SCE in cropland corresponds to a significantly lower soil pH in cropland. While a study in a pine forest also reported a negative relation of soil respiration with pH (Xu and Qi 2001), others found positive correlations in a beech forest (Søe and Buchmann 2005) and in a meadow (Reth et al. 2005). In an SRC planted on previous pasture there was a significant higher annual SCE as compared to previous cropland. This resulted from the higher initial carbon pool in the upper soil layer of grassland versus the year-long agricultural practices in the cropland, depleting the soil in carbon. Narrow inter-row spacings were linked to a higher annual SCE when compared with wider inter-row spacings, coinciding with a higher fine root biomass and lower soil bulk density in the narrow inter-row spacings. The distances to trees were weakly correlated with annual SCE which could be attributed to the relation with root biomass, being higher closer to a tree. Consequently we assumed that the effect of land use type could be attributed to differences in heterotrophic respiration whereas the effect of inter-row spacing was influenced by autotrophic respiration. As we expected, no influence of the planted Populus genotype was found. Differences in spatial site characteristics may be of great importance for understanding the effect of ecosystem management and land use change on soil respiration processes and our results may help us to investigate the role of soil CO2 efflux in the ecosystem carbon balance. This research has received funding from the European Research Council under the European Commission’s Seventh Framework Programme (FP7/2007-2013) as ERC grant agreement n°. 233366 (POPFULL), as well as from the Flemish Hercules Foundation as Infrastructure contract ZW09-06. Further funding was provided by the Flemish Methusalem Programme and by the Research Council of the University of Antwerp. We gratefully acknowledge the excellent technical support of Joris Cools and the logistic support of Kristof Mouton at the field site. 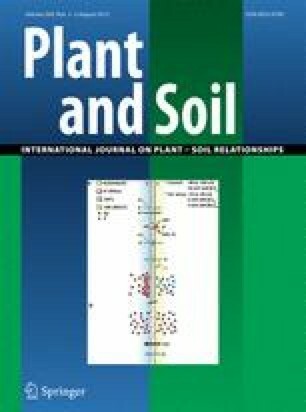 We thank Gerrit Switsers and Nadine Calluy for C&N-analysis, Gonzalo Berhongaray for collaboration with root picking, Sara Vicca for help with MATLAB analysis, prof. Ivan Janssens for comments on an earlier version of the manuscript and the Soil Service of Belgium for chemical soil analysis.